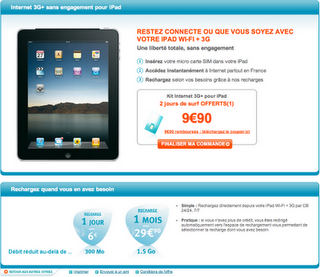 The French mobile carrier rumored to have the best customer service offers an iPad specific prepaid data plan. You can get unlimited data for a day for €6 and unlimited data for a month for €29.90. The only problem is that their tutorial on how to create an account after purchasing an iPad specific sim card is erroneous at best. Once you have purchased and installed their micro-sim card in your iPad, Bouygues Telecom instructs you to download their iPad app from the App Store although there is no iPad specific Bouygues Telecom app there. There's an iPhone specific app but it is not functional. The €9.90 sim card gives you 2 days of unlimited data. After that, you'll have to create an account using Safari (as their iPhone app does not exist): any url entered in Safari when connected to the cellular network will direct you to the carrier specific page in order to create an account. The only problem is that it fails every time you attempt to do so. So, you're basically stuck calling their 1034 line where, apparently, nobody has heard of their iPad specific offers. Great for the best customer service carrier in France!